In an effort to offer a more balanced assessment, four Abbotsford editors have assembled Being the Church in Abbotsford, which offers 11 ‘reflective essays’ on various aspects of the church in Abbotsford. The assertion that there are more churches per capita than almost anywhere else in Canada is quite possibly true. An appendix lists 108 churches in a city of about 135,000 people. However, the book also recognizes that there are large groups of Sikhs and non-religious people, as well as representatives of many other religions in the city. Perhaps the most impressive essay is chapter 3, which describes how the church “shows love to the city.” More than any other chapter it flips on its head the assertion that the Christian population primarily uses the Bible as a weapon. Even well-informed Christians in the city may be surprised at the vast number of individual, church and parachurch Christian outreach ministries in the city. The churches of the city teach the virtues of hard work, but they have guaranteed that the city’s food bank will never run out of food. The churches teach sexual purity, but offer ministries specifically to prostitutes. The churches teach temperance, but offer a wide variety of ministries to help men and women overcome addictions. The churches teach marital faithfulness but offer Divorce Care programs to help those who are divorced. This supposedly judgmental church devotes a great deal of effort to helping the poor, homeless and broken people of the city. Other chapters look at Christians’ involvement in education, health, the arts, business and politics – with a healthy dose of objective reflection and self-criticism mixed in. Probably to a greater extent than most other places in Canada, the Christian community in Abbotsford is dominated by churches that can be included under the broad category of ‘evangelical.’ Two chapters in this book highlight the two largest groupings: Mennonite and Reformed. However, the four editors (Ron Dart, David Giesbrecht, Hans Kouwenberg and Christoph Reiners) represent a variety of denominational backgrounds, and the book takes note of both interchurch and interfaith relationships. 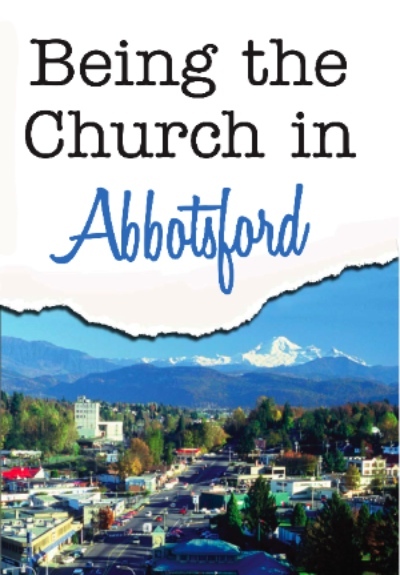 Being the Church in Abbotsford was also envisioned as an update on a book published 20 years ago: The Church in the Heart of the Valley: 1892-1992, which offered a more institutional and historical look at the church in the city. The two volumes show how far the church has come and how much it has adapted its programs to meet the needs of the world around it. Being the Church in Abbotsford (128 pp, $10) is published by Mill Lake Books and is distributed through Judson Lake House Publishers and House of James.